The Mariners commercials were released yesterday, and it looks like the Mariners went for quality over quantity this year. By now, I am guessing everyone has already seen them, since it’s something we look forward to every year. It also looks like the team took a somewhat safe route in including mostly face of the franchise-types who are contracted with us for a while, so they will be able to play all the commercials throughout the season, rather than have to pull some of them as players are traded or worse yet, have their skills fail them. Fullness and Sheen was only fun before Richie Sexson bit the dust, much like Fernando Rodney’s arrow commercial from last year. I think this year my favorite is probably K-Swag (featuring C-Fresh, naturally), with Felix’s clubhouse royalty questions following a close second; but as usual, they’re all creative and well-done. The bloopers are also worth a watch, again just like last year. Honestly, I may have some I like more than others, but the Mariners have always made the most of their roster with these, and I have yet to complain about any of them. They’re always unique, and always fun. I don’t want to neglect mentioning the light bat, but Edgar’s playing time was a bit before I was a fan, and while I totally love it, I don’t have the same connection to it that a lot of other fans do. I will have to settle for Edgar Martinez; hitting coach, taco and tequila purveyor, and best DH ever to DH. With Mariners commercial day comes good news and bad news. Bad news first, the release of Justin DeFratus. Apparently he just wasn’t doing as well as the organization had hoped. I don’t know DeFratus well enough to have any true comment on the situation, but we are having a hell of a time getting the bullpen to do what we need it to do right now, and it just feels weird to have this be our weakness, after it’s been a strength for so long. It seems like we can have great pitching or decent offense, or great defense, but we can’t have all three at once. So as things are right now, if injuries don’t work themselves out, we’re going into this season with a pretty uneven team. Based on the small sample size I’ve been able to personally witness (and oh boy has it been small), out of the group of Mayckol Guaipe, Joel Peralta, Jonathan Aro, Casey Coleman, Blake Parker and Tony Zych, I’d like to take my chances on the latter two. I liked Parker’s work in the game on Sunday, and I’ve heard decent things about Zych, but we clearly need more help than that, and Guaipe and Aro need more work away from the majors if at all possible. The good news is that Charlie Furbush took some throws the other day and claimed to feel better; but even then I’m approaching the good news cautiously. A torn rotator cuff isn’t anything to mess around with. Mike Montgomery and Vidal Nuno are also in the picture, so maybe things aren’t dumpster fire terrible just yet, but the uncertainty is making me really nervous. Starting the year with so many questions marks doesn’t feel like an improvement, but it does feel very Mariners, so I guess we have that going for us. 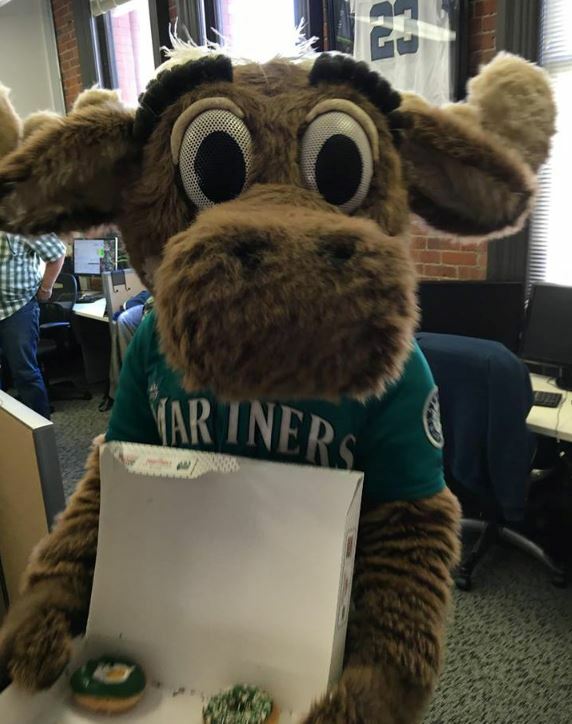 Lastly, my friend Aaron posted on Facebook about an hour ago that the Mariner Moose was in his office, handing out donuts to people. What a great way to start your Thursday!